You’ve just finished writing the perfect blog post! You did a quick glance over it and you’re ready to hit that bright blue ‘Publish’ button, but wait! 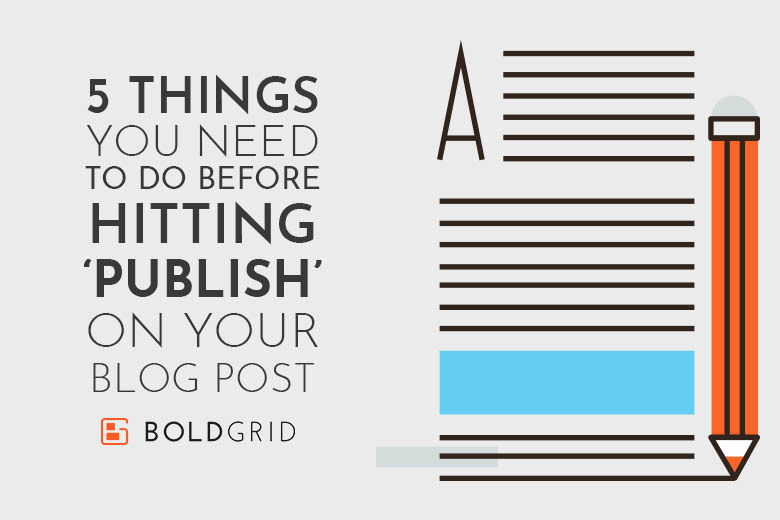 There are several things that you should do before publishing to make sure your hard work doesn’t go to waste. Today, we’re going to go over the top five things that you need to do before hitting the ‘Publish’ button on your blog post! Every writer makes mistakes. These could be very minor mistakes, such as an unneeded capitalized letter, or maybe the wrong type of ‘there’! These happen. In fact, in this blog post, many edits were made before it even was passed along for review. No matter what, taking the time to proofread your post is an important step of pre-publishing and a skill that is developed over time. Below I have included a few tips that have helped me with proofreading. Read your post out loud – as weird as it may seem, reading your post out loud can make mistakes stand out, making it easier to catch them! Don’t proofread right after writing the post – give yourself some time after writing to come back and proofread. I’ll usually write a post, then spend a few hours on other projects and then come back to do a proofread. This allows you to take a fresh look and get a different perspective. Don’t rely on grammar checking software – as much as they say how helpful they are, there are a lot of inaccuracies. After you take a final proofread of your post, pass it along to a friend, spouse, or colleague for review. Simply have someone else read over a piece of content and make any edits that they see your article might need. Visuals are a huge part of today’s online consumption. This is why websites like YouTube and Netflix are booming. 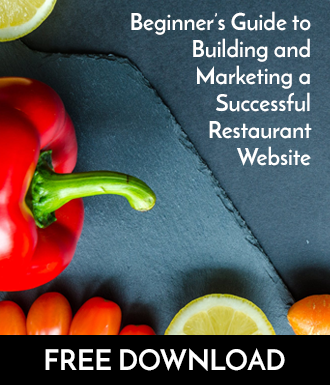 A simple image can attract visitors to your blog post. For instance, at the top of this blog post, we’ve include a simple image to help this blog post communicate and connect better with our audience. The hero image also works in combo with the post title, bringing a visual element to the subject of your post. We think it’s an absolute MUST to have a hero image on each of your blog posts. Most every blog post has a purpose. Whether that be to teach your visitor how to do something, share a tip, or even build trust through sharing customer testimonials, each type of post needs a call to action. Wonder how to do this? Let me give you some examples. Final paragraph with CTA: Making the most delicious ice cream isn’t as difficult as it may seem. Whether you’re a brownie caramel lover, or a very berry strawberry lover, today, we’ve shared how to turn your favorite flavors into something that you’ll crave everyday! Want to speed up the process? Check out our NEW super speed ice cream maker! In this example, we taught our visitor how to make delicious ice cream, but as a way to bring it back to our product, we used a CTA to inform them of a new product that could speed up the process. The bolded/underlined text would be linked to our ice cream maker page. Let’s take a look at another example. Final paragraph with CTA: With this change, our executive management team will be shifting their priorities to joining forces with our taste testing team, to ensure that not only are things tasting right, but that every flavor is made with the freshest ingredients. We urge you to visit our Fresh Guarantee page to keep up with how we process each ingredient. It’s because of you, our valued customer, that we hold the highest quality over any other ice cream company. This example was an informative blog post. In fact, this could probably even qualify for being a possible press release, depending upon the rest of the article. As you can see, we pointed our visitors to visit the ‘Fresh Guarantee’ page. This isn’t the same as a direct sale CTA, but is a great way to keep visitors on your website and not just leaving after reading. We share these examples to show you that really no matter the type of post, you can include a CTA. Lastly, CTAs don’t have to be links. They can be buttons, and even images. This little example is a great way of using a button and graphic as a CTA. It’s not overwhelming and allows the viewer to easily understand where the ‘See Features’ button should take them. Go through each section of your post to make sure that it is flows smoothly. If you have a large paragraph, consider breaking it up into smaller chunks, making it easier to read. While breaking up your paragraphs can help the flow, adding subheadings can be a major help. Every 350-400 words, work to add a subheading over that section. These subheadings don’t have to be complex, but rather something that gives a clear overview of what’s to come. While you’re looking over the formatting of your post, make sure to use the right page heading levels. You will want to make sure that only your page title is using a H1. Your subheadings can be H2s and H3s, if need be. We don’t recommend using H4s unless you are writing a longer post that might be more complex. This will make it super easy for readers to ‘skim’ your post and find the information that they are looking for. As much as some may dislike having to worry about SEO, adding a meta description to your post is super simple. If you’re using WordPress, it’s as simple as installing the BoldGrid SEO plugin and then typing up the meta information at the bottom of your post. If you want to learn more about meta descriptions, check out our recent post all about Meta Descriptions. What you write in your meta description is ultimately a super short sales pitch of why someone should click and read your article. You want to aim to keep them 300 words or less. The ultimate goal is to do right between 100-300 words. The meta description helps Google figure out what type of content is on your website. If Google doesn’t agree with what you’ve written for your meta description, they’ll usually replace it with a section directly from your post. Once you have completed these five steps, you are all set to publish your blog post. Now while there might be additional steps around keyword research, we believe that the keyword research steps should be taken before you begin writing your article. Congratulations on your new blog post! It’s exciting. Don’t forget to share your post on social media.